Break the ice and blow their minds with fun, friendly interactive wedding entertainment! Perfect to keep your guests busy during your afternoon reception and wedding photographs or to fill in the lull between the wedding breakfast meal and evening reception. Treat your guests with something DIFFERENT to talk about! Well overdue wedding magician video! Although I do occasionally post short Instagram magic videos and client testimonials and other magic clips to my Close Up Magician – Oliver Parker Facebook page – it has definitely been too many a moon since I made a new promotional video! I’m sorry. Will you ever forgive me? I got too caught up blowing everybody’s minds around the world, and even though I have a whole archive of incredible video footage, I neglected actually editing it together and showing the rest of the world. 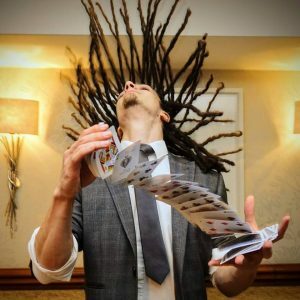 If you agree that a wedding magician is a totally awesome idea – please get in touch to see if I can help your big day!